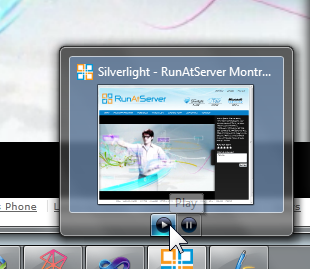 Following my article on IE9 and Windows 7 integration, here is how you could go further by controlling an IE9 hosted Silverlight video from Windows 7 taskbar. 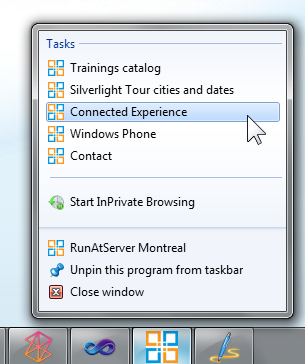 If you have IE9 on Windows 7, you can try a live demo by visiting www.runatserver.com and dragging the browser tab to your taskbar, then select “Connected Experience” from the JumpList. (I explain how to create such a list in my previous article). Note that you get a live preview in the taskbar’s thumbnail, and you can control the video! How to build this experience ? Line 3: SLObject is the Id of my Silverlight object tag. Lines 19 and 20: Set both buttons visible and enabled. Now you will automatically get 2 buttons in the live thumbnail from the Windows 7 taskbar, and be able to play/pause the Silverlight video! 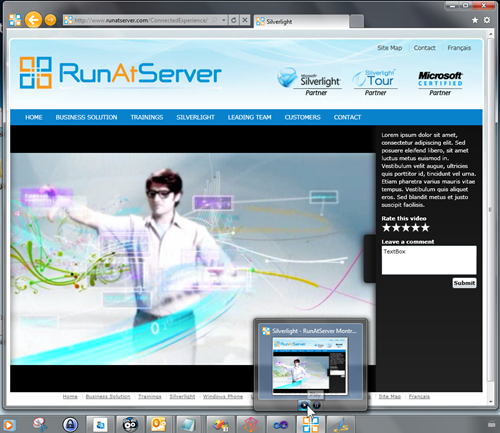 The only thing I wasn’t able to do is installing the Silverlight app Out-Of-Browser right from the thumbnail. I think because Application.Current.Install(); must be called from a user initiated event (mouse or keyboard event in Silverlight).